There’s no better time to visit Main Street then the holidays. Winter celebrations bring revelers together to enjoy light shows, caroling and special shopping experiences with local merchants. There is a magic to shopping on Main Street that simply doesn’t exist at the mall. We can feel good about our shopping because keeping the cash register ringing at these local stores not only benefits the shop owner but the entire local economy. This holiday season those benefits are multiplied. 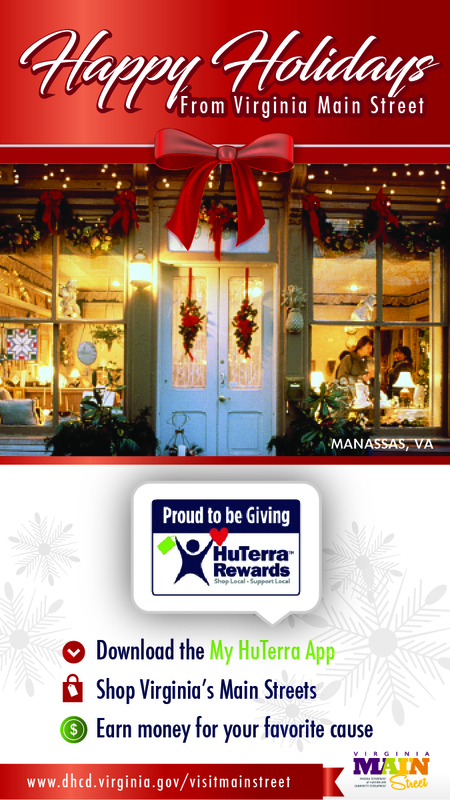 From November 15 to December 31, 2016, Virginia Main Street, in partnership with the HuTerra Foundation, will promote both shopping local on Main Street and supporting local nonprofits. HuTerra is a great supporter of Main Street organizations with a goal to connect small businesses to the community by increasing customer traffic via their mobile app, My HuTerra, available for iOS or Android. Download the My HuTerra app, pick your favorite nonprofit, and play the “Holidays on Main” game. When you visit the local merchants at participating Virginia Main Street communities during the holidays, simply “check in” for a chance to win a gift basket or $5000 for your favorite nonprofit. By shopping locally you can help HuTerra give away $50,000 to nonprofits throughout Virginia!